We link product type (from a product perspective) and usage id (from a usage perspective) to refine the development of each API for certain applications. A single request can return a multi-page PDF report (as many as 40+ pages). A typical data model, containing properties of parsed input parameters and web links to outputs, is shown in Figure 3. 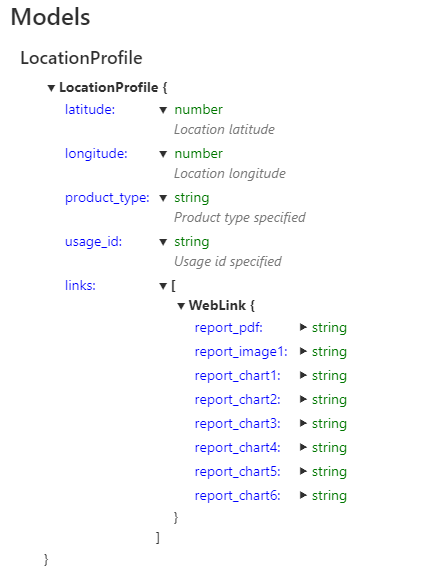 The formats of inputs, outputs and data models are similar for all APIs released. Location Profile APIs return an integrated set of location metrics about a site and its immediate neighbourhood. In this way site-specific location information is enriched with local context. Our APIs not only retrieve location information from multiple spatial databases, but also implement spatial analytics (e.g. terrain analysis) on the fly for contextual insights. The development of our APIs is with a number of potential applications in mind, so some essential domain knowledge can be imbedded. From a user’s or developer’s perspective, it is very straightforward to use integrated APIs. If location information is too scattered or piecemeal, it would still be a daunting and time-consuming task for developers to interpret and consume numerous APIs from multiple vendors. 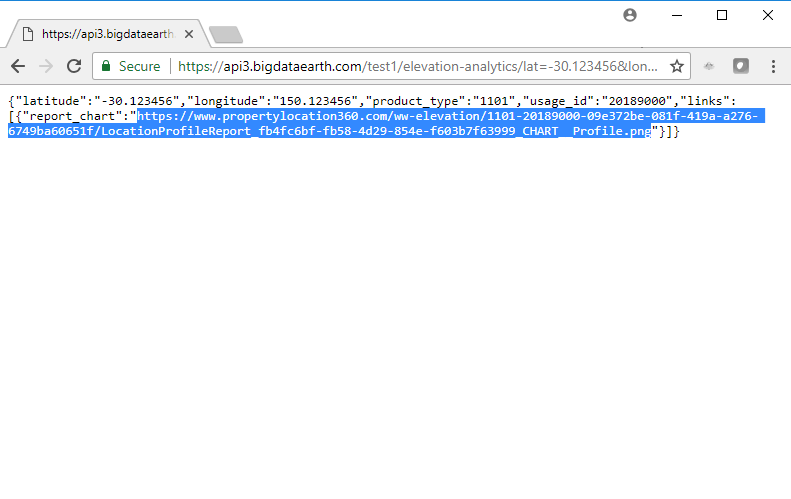 Our high-level, application-oriented APIs with location metrics in many forms can be complementary to other mapping APIs widely available today (e.g. Google Maps APIs). Our APIs have access to a number of open authoritative datasets from government agencies, including Geoscience Australia and the USGS. We often add pre-processing and critical evaluation to make sure the dataset is suitable for intended applications. The data sources analysed are acknowledged in the output of each API product. As our API workflow is generic, it is flexible to rapidly digest other finer-resolution, domain-specific datasets (e.g. LiDAR-based DEM for flood modelling, hazards data for risk analytics, and company exposure data for asset management). Our backend servers and data analytics engines are resided in and powered by Google Cloud Platform. The use of API usually requires a unique API key (containing both key name and value) for validation and secure data access. The API key name could be varied (e.g. apikey, x-api-key, or cp-Apim-Subscription-Key). API key is often put in HTTP request Headers, but sometimes in the request string up to certain setup. These are live examples. 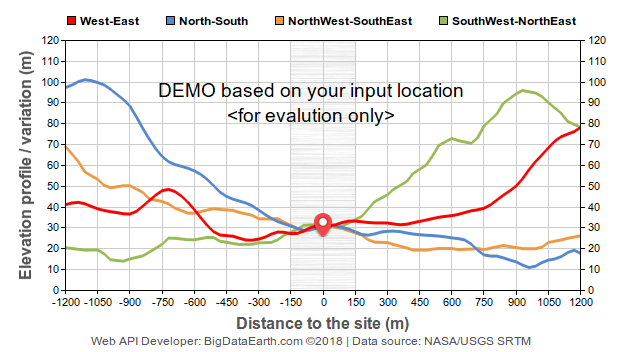 Interested users can change latitude and longitude values to get corresponding elevation profile charts. Tips: change the file name extension of the output file from PDF to PNG, a chart in PNG format can be downloaded as well. 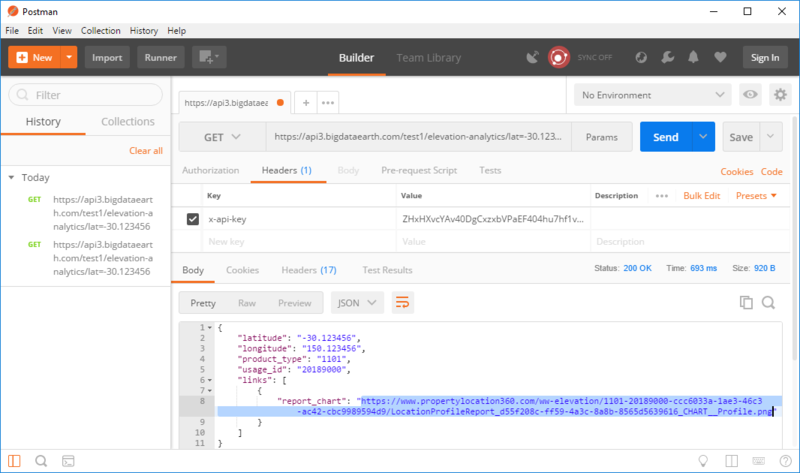 We encourage interested users to explore the developer portal and test APIs. Access key is automatically assigned after sign-in and product subscription. For the demo API, approval is not needed. Our APIs can be complementary to the tools and functions your system is already providing. A developer can resort to third-party APIs to automate and deliver certain on-demand tasks to accelerate application development and gain competitive edge. 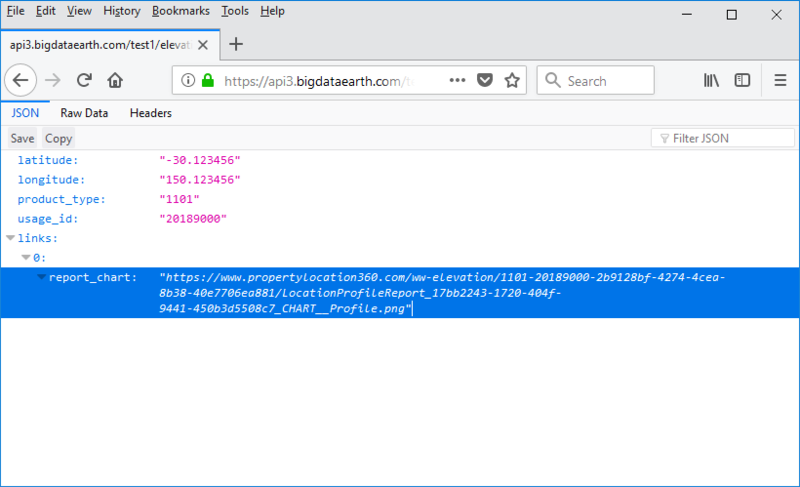 A common application scenario is that a client provides our APIs with known geocoded location and requests a location profile report, which will be accessible near real time or in seconds. So your client can get even more location intelligence before making informed location decisions. Customisation can be facilitated to create white-label reports for various application needs and scenarios. We plan to share new applications of our Location Profile APIs in future blogs. Meanwhile, we stress the importance of high-quality data and in-depth analytics and modelling, and aim to develop more domain-specific APIs that are easy-to-use, powerful and scalable. APIs enable faster data and information sharing and system integration, and the use of APIs can significantly improve business efficiency, agility and productivity. 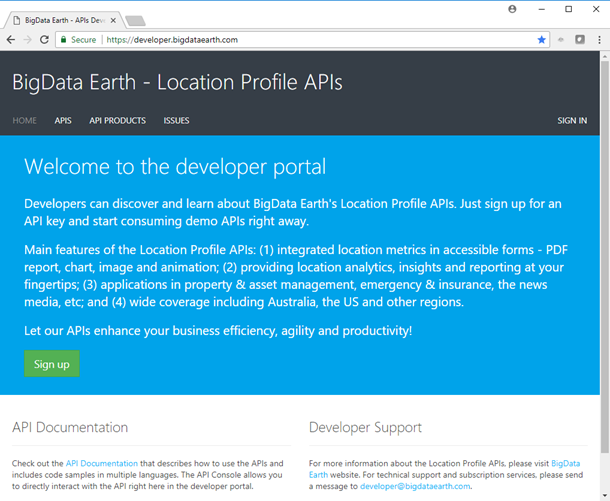 The current release of Location Profile API products opens our resources and marks a start for more collaborations and partnerships in our business development at BigData Earth. If you are interested in exploring our unique Location Profile APIs or creating tailored APIs with your own data, please let us know.